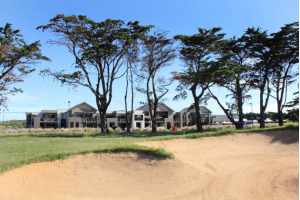 Barwon Heads Resort at 13th Beach offers a relaxed yet luxurious experience right on the spectacular 13th Beach golf course. Offering 1 & 2 bedroom self-contained apartments, this is the perfect place to stay for couples or groups. The resort boasts a restaurant and bar area, gym, pool and conference facilities and is within a short walking distance to the spectacular sand dunes of Thirteenth Beach. Located just minutes from Barwon Heads township and only 15 minutes from Torquay, this really is the perfect place to base yourself while on a trip to the area.